Tart, smooth and creamy lime cheesecake squares with a sweet, crumbly graham cracker crust covered in silky smooth dark chocolate. Perfect to serve at your next summer get-together with family & friends. There’s a little Key Lime Shoppe in Key West, Florida that sells Chocolate-Dipped Key Lime Pie on a stick. It’s a heavenly treat, especially on a hot summer day when you’ve been shopping the cute little shops for hours. 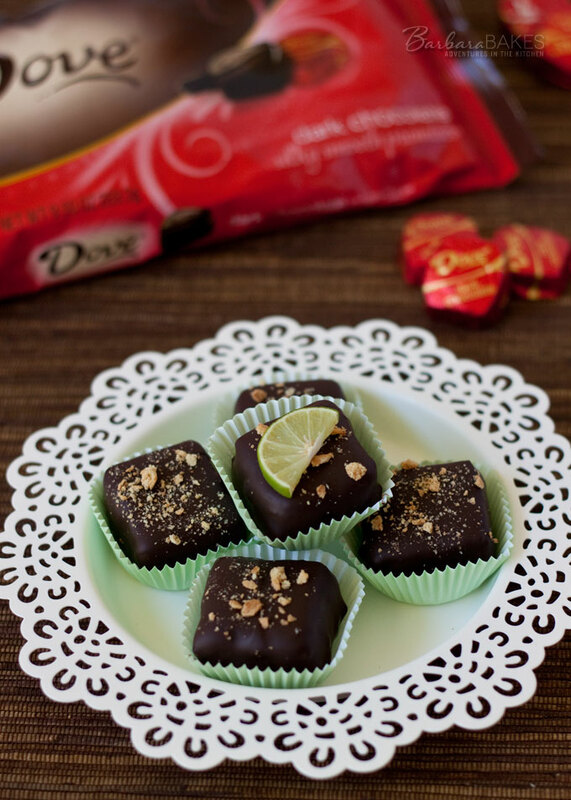 This is my easier-to-make version of that key lime treat covered in luscious DOVE Dark Chocolate. It’s the second of three recipes that I’m creating for DOVE Chocolate this summer. All using Dove Silky Smooth Dark Chocolate. If you missed the first recipe, Easy Brownie Cake Pops, be sure and check it out. A graham cracker crust is easy to make at home. Just finely crush a package of graham crackers in a food processor. Or, you can do what my husband did, and use a rolling pin to crush the crackers in a Ziploc bag. Add a little bit of sugar and a little bit of butter, and firmly press the crumbs in to the bottom of the pan. I used the bottom of a flat glass to press the graham cracker in to the pan. Add your cheesecake filling on top of your graham cracker crust, bake the cheesecake, and then let it cool at least 4 hours before you cut it in to squares. I let mine chill overnight so it would be easier to cut. I like to use a long serrated knife to cut the cheesecake, and I rinse the knife in hot water and dry it before cutting the next row. I used a chocolate dipping fork to hold the cheesecake square over the bowl of chocolate, but a regular fork would work as well. Then using a large serving spoon, pour chocolate over the square covering the top and sides, and letting the excess chocolate drip back in to the bowl. You can also gently tap the fork on the side of the bowl to help remove excess chocolate. After placing the chocolate covered cheesecake bites on the baking tray, sprinkle each square with a little crushed Keebler graham crackers. It’s a fun way to dress up your cheesecake bites, and a great suggestion from my sweet friend Tiffany. All you really need is love, and a little chocolate doesn’t hurt. I know you and you’re guests will love having a little dark chocolate with your cheesecake this summer. Heat oven to 350°F. Line 8-inch square baking pan with aluminum foil, extending foil over ends of pan. Spray foil with non-stick cooking spray. 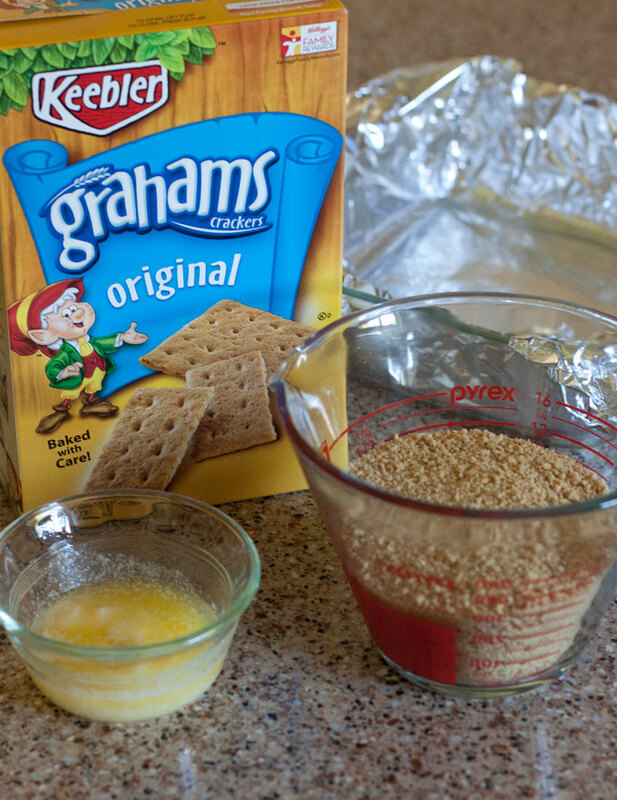 Combine crushed graham crackers, 3 tablespoons sugar, and butter in a small bowl. Press firmly in to bottom of prepared pan. Combine softened cream cheese and 1/3 cup sugar in a mixing bowl. Beat at medium speed, scraping bowl often, until creamy. Add egg and vanilla, beating just until combine. On low speed, mix in key lime juice and sour cream. Pour over crust. Lift cheesecake from pan using foil ends. Cut into six rows each directions; 36 squares. Place squares on a parchment or Silpat lined baking sheet and freeze for 1 hour. In a microwave safe dish, heat Dove chocolate and shortening on 50% power for 1 minute; stir. Continue microwaving and stirring in 30-second intervals on 50% power until melted and smooth. Hold a cheesecake square over the bowl of melted chocolate and use a spoon to pour chocolate over the square allowing excess chocolate to drip back in to the bowl. Place the square back on the baking sheet. 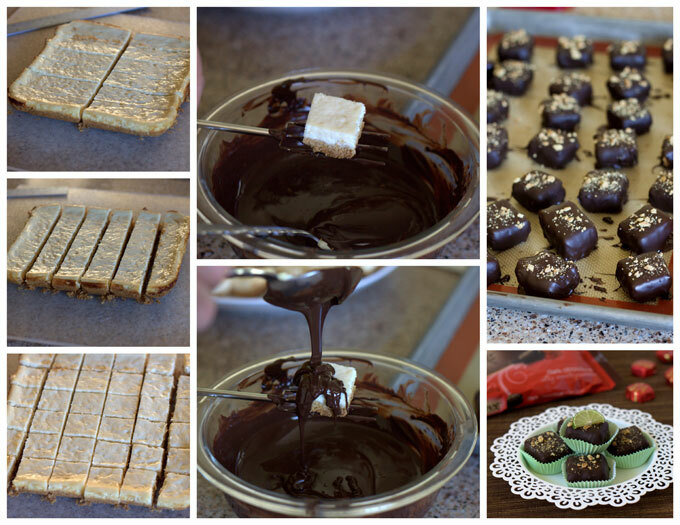 If desired, sprinkle additional crushed graham cracker on top while the chocolate is still wet. Refrigerated bites until ready to serve. You can also find DOVE® Dark Chocolate on Facebook, and Twitter. 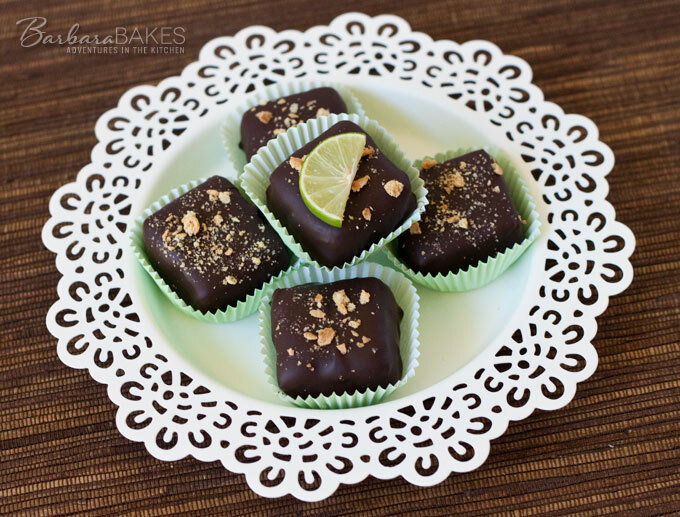 I love how you combined chocolate, cheesecake and lime together. Isn’t it wonderful? I definitely love these bites! I love that Dove dark chocolate – what a fun sweet!! What a recipe!!!! Chocolate and cheesecake and lime flavor all in gathered together in one treat. It’s angel food as far as I am concerned. I suspect that not just the female angels would enjoy this special treat. I pinned it—-duh, of course. wow!! I Love chocolate, I love cheesecake and i love lime flavor. I want to have a bite of it right now 🙂 I can wait to try this home.. They look like the perfect hint of everything. Love the combo here. I love key lime cheesecake but covered in chocolate makes it a real winner for me. Yours look beautiful, Barbara! LOVE this idea Barbara! Little ” anything” bites with chocolate over them is always a HIT!! would love to try this recipe very soon!! What a lovely sweet treat Barbara! I just love the touch of crushed biscuits on top. They are so neat and tidy – you must be very good at chocolate coating. Key lime pie is a favourite of mine, will have to try this unique idea. Love these cheesecake bites! They sound and look terrific, Barbara. Cheesecake bars look very beautiful 🙂 elegant and nice for any occasion! A fantastic idea! These bites must taste divine. I love that these are covered in chocolate!